I’m really rather reluctant to do this, but in the last day or so, I’ve had to decide that I have to. I’ve simply run out of time to do this blog the way I want to. I don’t know if you’ve noticed, but I’ve in effect been coasting for most of past month — what with my brief vacation trip to Michigan, a video card malfunction when I came back, then the break-in into my storage areas. This most recent problem has forced me to start moving massive amount of books around, which is what I’ve been doing all of this past week. But more than ever, it’s also made me realize that I actually do have massive amounts of books to move around. By massive, I mean in the high five figures. And most of them are books I didn’t even know I had. I’m also always in the process of adjusting my thyroid medication. If it’s right one week, the next week’s it’s not. Doing the blog has been great fun, but on another level, it’s also stressful, which doesn’t help, and I’m constantly frustrated that I can’t do more. Hibernation means (for animals) being dormant for the winter months. It’s a little early for winter, and the dormancy here may or may not last longer than that, but even the most grumpy of growly bears arouses himself every once in a while during his siesta, and gets up and prowls around for a while before heading back to his cave again. I’ll do the same. In the sidebar on the right are a couple of projects I will be continuing to work on, and when there’s a major page added, I’ll be sure to announce it here. I’m referring first to Al Hubin’s Addenda to his Revised Crime Fiction IV, which I’m always in the process of annotating and embellishing; and secondly, I’m working with Bill Pronzini in adding more cover images to the Murder at 3 Cents a Day website. The latter’s been neglected in recent weeks, but I’ll start working on the books from Mystery House soon. Victor Berch and I have one or two other projects in progress. It’s extremely easy for us to keep coming up with others, and there’s no doubt that we will. Bruce Grossman just sent me another map to be included in the preceding post, and Jamie Sturgeon has said that he’s already come up with others. There’s no reason why I shouldn’t keep posting them here. In fact, figuratively speaking, I have drawer here in my desk that’s simply overflowing with reviews, checklists, paperback covers and other material to share with you, but alas, for now, for the reasons above and more, I’m simply not able. I wish it were otherwise, but not so. Maps in Mysteries, Part 3. Rather than wait for me to add mine to his to create one long entry, I’ve finally decided to run only the four that he’s sent me most recently. First, he says, how about this double one from Fatal Friday by Francis Gerard? Fatal Friday (Rich, 1937, hc) [Chief Insp. (Supt.) Sir John Meredith; England] Holt, 1937. Here’s one of the more elaborate maps Jamie says he’s ever seen in a crime novel, one that he sent me while my computer was down. It comes from Angel in the Case by Evelyn Elder (Milward Kennedy), a very scarce book. Some other Methuen books of the period have these maps on the front endpapers as well. The Pressure-Gauge Murder (Methuen, 1929, hc) [South Africa] Dutton, 1930. [UPDATE] 10-25-07. The British contingent of crime authors didn’t have a monopoly on maps in mysteries, of course. Bruce Grossman sent this one along, taken from Ellery Queen’s The Dutch Shoe Mystery. In particular, it’s from the softcover edition of Otto Penzler’s reprint, so we’re assuming that it’s the same as the one in the original First Edition. A couple of my self-storage units were broken into this past weekend, as I discovered yesterday afternoon. The thieves got into about 160 units in all, I was told. They saw the boxes of books in mine, rummaged around for a while, then left. They smashed the door latch on one of the units, though, so it couldn’t be used. I had to move everything out of that one into the other, filling up the “aisle” I’d left, and leaving no room to move around at all. It wasn’t much fun. Luckily it was a beautiful day. I didn’t think anything of it when it posted yesterday’s entry here, but somehow Google picked up on it very quickly, and today’s total number of visitors has surpassed that of any other day so far except (perhaps) the day the passing of Donald Hamilton was posted here first. Maybe some hints are in order? Don’t keep reading if you don’t want any help. 49 ACROSS: Author said to have influenced Hitchcock. [Three letters.] This one should be extremely easy for mystery fans. It’s exactly who should come to mind immediately, but I’d also have to concede that I don’t know how true it is. I have a confession to make. Before I picked up on the answer, I had some letters going down through 51 ACROSS: Street boss. [Ten letters.] So I was asking you to do something that I didn’t quite do myself, but I was hoping that the primary focus of this blog would compensate for that, at least maybe in part. You’ll know it when you get this one right, it will feel so good. [UPDATE] 10-22-07. The answers are in this morning’s paper, so I may as well provide them too. See the comment. Today’s Tribune crossword puzzle had some interesting challenges, and not only because Saturday’s offering is always the toughest of the week. The Tribune puzzles are not quite [41 DOWN] with those in the New York Times, but they often come close. Today’s was especially enjoyable, with just the right degree of cleverness and difficulty. 40 DOWN: 1947 signature Cab Calloway musical. ANS. HiDeHo. One that would have had me stumped completely unless I hadn’t had all of the words coming down was 38 ACROSS: Rodent yielding the fur nutria. Not my particular expertise, I guess. I had to check with Google when I was done to be sure the answer was even a word. It was. Here are a few more for which I won’t give answers. 41 DOWN. At the same level (with). ANS. OnaPar. Addenda to the Revised CRIME FICTION IV – Part 20. It was just over a month ago — on September 18th, to be precise — that I announced that Part 19 of the Addenda to the Revised Crime Fiction IV, by Allen J. Hubin, was online. But new data has continued to flow in — it never seems to even slow down — and Part 20 was uploaded this morning. In WordPerfect format, this installment was a mere 29 pages long. Most of the information consists of added (or corrected) years of birth and/or death, but a sizable chunk of what otherwise is new you will already have seen (I hope) in Victor Berch’s checklist of Tip Top Detective Tales. See the previous post on this blog. 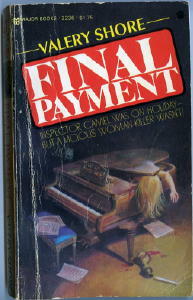 Also in Part 20, but rather hidden so that you might not notice it without my pointing it out, is that we have recently learned that the mystery novel, Final Payment, by “Valery Shore,” reviewed here several months ago, was not the sole work of Lon Viser, as until now has always been assumed. A Checklist of Aldine�s TIP TOP DETECTIVE TALES, by Victor A. Berch. You’ll have to go to the main Mystery*File website to find the checklist, I’m sorry to say, but on the other hand, it’s only a link away. Just click on the one provided. 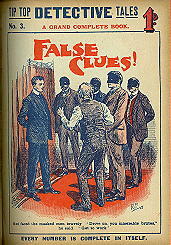 Tip Top Detective Tales was one of the Aldine Publishing Company�s many library series produced to capture the fancy of the youth of Great Britain. 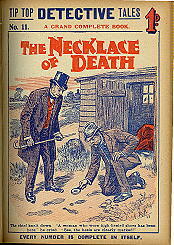 This particular one ran from 1910 through 1912 when it morphed into just Tip Top Tales, produced to include stories of adventure, as well as those of criminal content. With one exception, all of the novels included in the series were published anonymously. For a short history of the trials and tribulations of the Aldine Publishing Company, which was founded by Charles Perry Brown (1834-1916), see the excellent article by John Springhall, �Disseminating impure literature: the �penny dreadful� publishing business since 1860� in ECONOMIC HISTORY REVIEW, XLVII, 3 (1994), especially pages 578-584. Last week on his blog, Pulpetti, Juri Nummelin discussed the career of Gold Medal paperback writer Frank Castle, prompted by his (Juri’s) discovery of one of Castle’s books that was published in Finland but never in this country. If you’re interested, Juri does the obliging thing and translates the first few paragraphs back into English. Not much seems to be known about Frank Castle. You and the other commenters seem to have covered almost everything he did, unless you count his role as The Punisher for Marvel Comics beginning sometime around 1974. But maybe that was a different Frank Castle. And like the comic book guy, maybe our Frank Castle wasn�t his real name either. FRANK CASTLE. Born in New Mexico; graduate of University of Oklahoma; magazine and book writer. Pseudonym: Steve Thurman. �Mad Dog� Coll (n.) Monarch 1961 [New York City, NY; 1932] Novelization of film: Columbia, 1961. The problem, as I expected, was a video card, and a new one is on its way to me now. At the moment I have a limited, rather primitive window to the Internet, but at least I’m back online again. It took me two calls to Dell before they decided I might be right. I say “might” because the proof is in the doing — when the new card is finally installed, and it works. It was actually three calls to Dell, if you count the second fellow. I disagreed with his suggested remedy of disconnecting all of the connections to the back of the tower, and I asked to speak to someone else. Sure, he said, no problem. Is it permissible to say that I hate computers? but I’m having severe computer problems. I think it’s the monitor, but I’m no expert. Everything’s backed up, but I’m limited to only a few minutes at the computer at a time. I’ll be calling Dell tonight.